Two lectures in Bologna: on 31st March 2011 at the International Conference to Mark the Centenary of Rudolf Steiner's Lecture in Bologna, and on 8th April 1911 at the Fourth International Philosophy Congress. 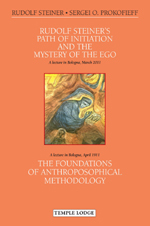 A special conference took place in Bologna in Spring 2011, marking the hundredth anniversary of a unique lecture Rudolf Steiner delivered to a philosophically-trained audience in the same city. In his key exposition, Steiner had given a concise description of the spiritual-scientific theory of knowledge as well as a brief outline of the anthroposophical path of schooling. In his contribution to the 2011 congress, Sergei O. Prokofieff tackles two principal aspects. On the one hand, he describes how Steiner's Bologna lecture contained the essential foundations for a new "science of the human ego". On the other hand, Prokofieff states that Rudolf Steiner was the first person to transform this same theory into a practical path of knowledge, following it to its very conclusion. Thus, the words of Rudolf Steiner's lecture were based entirely on personal experience. Together with a transcript of Rudolf Steiner's full Bologna lecture, Sergei O. Prokofieff's own lecture is reproduced here in an expanded version. In addition, this volume features Rudolf Steiner's important "summaries of essential points", in which he develops and connects some of his key thoughts with further aspects of anthroposophy, especially in relation to their Christological foundations. RUDOLF STEINER (1861-1925) called his spiritual philosophy "anthroposophy", meaning "wisdom of the human being". As a highly developed seer, he based his work on direct knowledge and perception of spiritual dimensions. He initiated a modern and universal "science of spirit", accessible to anyone willing to exercise clear and unprejudiced thinking. From his spiritual investigations Steiner provided suggestions for the renewal of many activities, including education (both general and special), agriculture, medicine, economics, architecture, science, philosophy, religion and the arts. Today there are thousands of schools, clinics, farms and other organizations involved in practical work based on his principles. His many published works feature his research into the spiritual nature of the human being, the evolution of the world and humanity, and methods of personal development. Steiner wrote some 30 books and delivered over 6000 lectures across Europe. In 1924 he founded the General Anthroposophical Society, which today has branches throughout the world.